From Pepsi Arena in Albany, New York, to Arrowhead Pond in Anaheim, California, coliseums coast-to-coast regularly fill with tens of thousands of women who come to laugh, cry, and celebrate life. Known for her storytelling, Marilyn Meberg has shed optimism from Iowa to South Africa. She began encouraging women at neighborhood Bible studies in her home. They comprise Women of Faith (WoF), one of the largest women’s organizations in the world. Audiences listen to contemporary Christian music artists and an ensemble of speakers loved for their straight talk and exuberant humor. Among them is author and humorist Marilyn Meberg, the 2005 Seattle Pacific University Alumna of the Year. For 30 weekends a year, Meberg has the crowds in stitches, practicing what admirers call “laughter therapy.” In the nine years since she helped launch the organization, WoF has welcomed a combined audience of more than 2.5 million. More than 10 percent of those women choose to become Christians as a result of WoF’s ministry. A licensed therapist, Meberg has no problem calling herself a “shrink.” She is a member of the Seattle Pacific Class of 1961 and holds master’s degrees in English from Cal State Fullerton and psychology from Pepperdine. And yet, says WoF teammate Luci Swindoll, getting her to act like a professional is next to impossible. Consider the time they were in New Zealand driving a rented dune buggy across the outback, their heads encased in crash helmets. Meberg at the wheel, Swindoll riding shotgun, they flew through the air from hump to knoll “like Thelma and Louise,” both of them laughing uncontrollably. It was either that or a kiwi fruit farm tour. Meberg says it was no contest. “If it weren’t for God’s sovereignty and my sense of humor, I could get quite anxious about my life,” she explains. 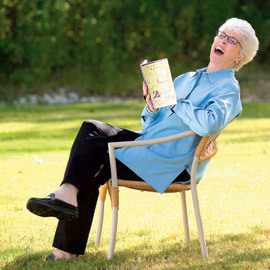 Through numerous books, published interviews, and live presentations, her passion to heal with humor flows like quicksilver. A rural Methodist minister in southwestern Washington, her dad was horrified when his adult daughter eventually joined the Presbyterian Church. Not that he didn’t see it coming. Her favorite aunt, his sister, had her own independent streak a mile wide. Even when she turned 100, “Auntie” insisted on driving despite her license having been revoked. To her niece, she was an inspiration. As was Seattle Pacific. She was Marilyn Ricker then, and a year after enrolling, she had her eye on a young man one year her senior, Ken Meberg. “I was in choir my sophomore year, and he was choir president,” says Meberg, who thought Ken was funny and gregarious. They quickly discovered that laughter was one of their strongest bonds. One of her fondest Seattle Pacific memories was the night she, Ken, and three other couples invited Dean of Women Marie Hollowell to join them for pizza. They kept her out so late that the dean was in violation of dorm curfew. “She was a dear, dear lady,” Meberg says, without a hint of repentance. The psychology major switched to English in order to become a teacher and support Ken through graduate school. They married and raised two children, son Jeff and daughter Beth, who say they remember life with their parents as a mostly merry proposition. At times, it was hard for the kids to fall asleep because of frequent evening vaudeville parties that parodied bad televange lists. Dad played the piano deliberately off-key and mom loudly sang “Precious Memories,” equally off-key. The guests roared. Then there was Meberg’s health-food kick that required the kids to appear at morning “vitamin line-ups.” Her husband used her less-than-successful baked organic wheat loaves for footrests. “We learned how to have good, clean fun,” says Beth, now a mother of two and a consulting child therapist, who works in Ohio schools with emotionally disturbed children. Meberg raised her children to be as independent as she. Beth is a Democrat despite having parents who were “diehard Republicans.” Both brother and sister support Meberg’s ministry, but Jeff disagrees with Mom on the ordination of women. She’s all for it; he objects on theological grounds. Yet family solidarity is the rule. Beth and Jeff have been to several WoF conferences and cannot imagine their mother being anyone but the encourager they believe she was meant to be. Meberg taught English at Biola University for 10 years, followed by another 10 years of private practice as a marriage and family counselor. She believes strongly in lifting burdens and helping the unchurched see how beautiful faith is. “I want people to hear that God is crazy about them and has ordained a way to have their load lifted,” she says. She draws from personal experience as she ministers to others. When Ken died of cancer after 29 years of marriage, Meberg struggled for perspective. But their shared laughter, which helped them over other rough roads, sustained her then as it does now. WoF audiences laugh till they cry when Meberg recounts the night she invited Swindoll to join her for a trip to the pharmacy. Meberg wanted to take the golf cart she used to get around her residential community in Palm Desert, California, though her friend pointed out that it was hardly “street ready.” They would stick to back roads, Meberg said, and off they lurched. All went well until the return trip, when the cart died in the street. By the cart’s headlights, Meberg used Swindoll’s cell phone to call AAA. “Before long, an enormous 18-wheeler tow thing as big as a house arrived and hoisted the cart like a paper clip,” Swindoll recalls. At Meberg’s driveway, the truck snorted backward amid loud warning beeps and rolled the cart into the garage while the women piled out of the cab, laughing. The neighbors poured from their houses to gawk, and the two fast friends had another gem for the telling. “That’s just Mare’s approach to things,” Swindoll says, using her pet name for Marilyn. “She knows the difference between a tragedy and a mere inconvenience.